When you study your own reflection, how well do you really know that person who’s looking back at you? Is she someone whose value is forever being held up for scrutiny and comparison to others? Are there dreams she plays close to her chest, as reluctant to divulge as she is to pursue? Is she someone you’d like to get to know better but haven’t a clue as to where you should start? 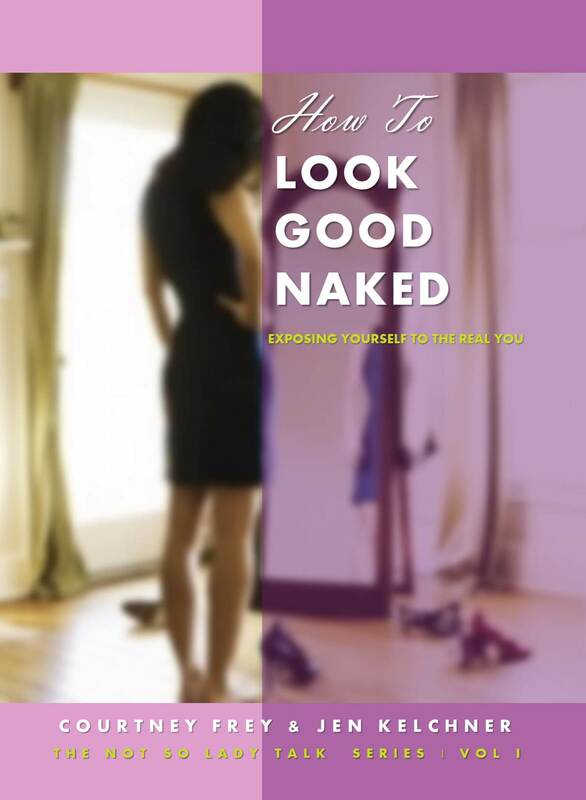 Authors Courtney Frey and Jen Kelchner just may have the answer to starting your own journey of discovery in their new release, How to Look Good Naked: Exposing Yourself to the Real You. Q: Let’s start with your respective backgrounds and what drives your passion. Jen: I worked with a Fortune 100 organization for a number of years in Administrative Management which is where I began my coaching career. Over the last three years, I have focused on my life coaching, writing and speaking in order to develop solid tools to help others on their personal journeys. I live in the Nashville, Tennessee area and have two almost grown sons. Courtney: I hold a B.S in Psychology and Human Services and have spoken across the country for women’s conferences in all avenues of women’s issues. I have a background in social work, sales, writing, and management and am the published author of several non-fiction women’s books. I live in Iowa with my amazing three teenagers, my significant other, and my three energized dogs. Q: I’m always curious how independent thinkers connect with kindred spirits and decide to collaborate. What’s the story behind how the two of you met? Jen: Ours is a crazy story to be sure! Courtney commented on a blog post of a friend of mine and they began to communicate. Then he introduced me to Courtney and it was love at first sight. I read her book and immediately knew we had been divinely placed in each other’s paths. Our stories, although different, had led to the same emotions and wounds to be overcome. I think it took us all of two days to realize we were truly kindred and that our purpose and passions were in alignment. It would be a fatal error to ignore something so powerful. So, we decided to launch this movement. All of this took place in the span of about six weeks from meeting to our decision to create change together. Q: The two of you have also recently founded your own company, www.igniteyourtruth.com. What inspired this decision and how did you go about structuring its development and subsequent launch? Jen: We met in April, formed the idea around the first of June, and we went live on July 1st of this year. Three years ago I made the decision to leave my corporate career for the sake of my relationship with my sons (which led me on my personal journey as it turns out). I realized about a year into that journey that my focus was no longer business but people. My sole purpose in life became to affect change in others and places around me. With each passing month, my focus became more and more laser-like to be bold with my passion and form an outreach. My problem was I really needed a counterpart to walk this out with me. I mean it is a tough journey to do solo! As Courtney and I developed our friendship in those few weeks, we saw how our energy, passions and visions matched so perfectly. In truth, we created a general outline for the short term and long term visions and just winged it from there. I designed our website and put our technical arena in place for podcast and off we went. Thankfully, we are both very resourceful gals and we operate from ingenuity and hard work to get whatever we need done. Q: What strengths do you each bring to the table? Jen: I have days I regret that I have technical skills as I see my task list grow and grow. My personal gifts really lie in being able to see a big picture when someone else is talking. It is like I see images or phrases forming in the air and can quickly snag those and connect dots. It really helps cut to the chase fast if I’m coaching an individual or helping a company identify their issues. Courtney: Thank God for Jen who can organize and deal with the technical side of things, because it’s like Chinese to me! Because she can magnificently handle the details, I am able to utilize my strengths and networks to really get out there and engage our marketing plan and focus on writing. Q: What is Ignite Your Truth and who is the target audience for your particular message? Jen: It is a movement to bring people into knowing who they are, know their value, having authentic relationships, helping them to change their thinking and embrace their visions. We are loved, valued and accepted. Q: “Not So Lady Talk” – the name of your new series – seems inconsistent at first glance with the genre of Christian/Spiritual. Was the choice of this phrase just a catchy marketing hook or is there a deeper connection in play to a faith-based platform? Jen: That is a great question! At our core, we talk about authenticity. Authenticity and transparency has been missing from the church for generations. Our generation craves authenticity. We are tired, bored and hungry for something real. There is a serious gap that needs to be addressed for women in the church culture, especially for women in their 30’s and 40’s. We are highly intelligent, multi-task and get things done. So, when we show up to a women’s function, we don’t want to swap recipes and chit-chat. We have apps for that. We want high-energy, deep, real conversation. We want to know that we can remove our masks and be unfiltered without judgment so we can address our needs. It might be inappropriate and not-so lady-like at times; but it is real and healing. We are out to redefine what women’s outreach looks like – especially for this generation. Q: Tell us about How To Look Good Naked, your first book in this series. Courtney: This book is really an exposing of our true selves and the journeys we have taken to getting to the truth of who we are. It’s not always pretty, and it’s very humbling. However, we wanted to be transparent in that journey so that other women would see and believe that they are not alone, they have grand purpose, and are unique and empowered. We address issues from identity to shame to self-acceptance all while being very vulnerable. Q: Did the two of you start with a formal outline of what you wanted to cover in the book or were you brainstorming as you went along? Jen: We started with a general outline for each chapter. Individually we went about our writing then pieced it together for proper flow. Any time we write, we wait until we feel a specific nudge for a topic. Our guideline helped us to stay on point but we really work as we feel directed individually and weirdly it always ties together. Q: Were you working in the same room this whole time or communicating via phone/email? What were the advantages/disadvantages of this collaborative approach? Jen: We live over 700 miles apart and have seen each other one time. We wear out Facebook instant messaging all day long! However, when we write we both unplug and then come back together to review. Somehow it all works together perfectly. Q: How did the two of you resolve creative differences such as what to put on the cover, how to organize the content, what to add/delete, etc.? Jen: Thankfully we balance each other very well. Courtney defers to my graphic design talents and she will tell me if she doesn’t like it. Since I’m the “organizer” of the two of us she lets me manage the content, edit and such. Q: What’s the best part of working with a partner? Courtney: We definitely balance one another out. Not every day is an easy day and having a partner who is able to be strong when you are weak, who can pull you up and inspire you, is definitely a key to our success. Jen: I agree that our being in this together is what is making this work so well. Our personal stories include a lot of being the odd ball in our lives, never really being accepted as we grew up. And, let’s face it that entrepreneurs and game changers are generally odd balls. We push the boundaries of what is acceptable in societal norms – especially as women and mothers. Q: You share several personal experiences in your book and state that everyone has a story and that story matters. Please elaborate on this. Jen: A lot of times we want to run from our stories because we carry guilt or shame with them. We need to encourage each other to embrace our stories and that we are the authors of the chapters yet to be written. Our past gives us a rich history to draw from that can encourage others and provide us with new tools and skills. Our stories serve others and build communities of change. There is freedom in owning your story…it cripples fear and returns the power to you. Q: What inspired each of you to break through your own layers of roles, labels and inhibitions over the course of dispensing advice to your prospective readers? Courtney: I desired first and foremost to be authentic. If I was going to talk to women about exposing their true selves, I had to be willing to really go there as well. I didn’t want to just talk the talk; I wanted to walk with them hand in hand through the journey. I believe that the best support comes from those who have gone through the valleys and come victoriously out the other end. And, if I wasn’t willing to do that with my readers then the message was false. Jen: Definitely. In my own journey, the only thing I have found to keep fear at bay is to be authentic and put it out there. I am empowered when I put my life out there. Fear dissipates. The need for others acceptance becomes invalid. It’s freeing. Q: Would you categorize this book more as self-help or inspirational? Jen: Honestly, I can’t stand labels and so have a difficult time knowing how someone else wants to categorize it. It’s a real, honest look at life and humanity. It is inspirational as it offers hope that you can really overcome anything. It is also self-help because it provides tools and direction. Then again, you could stick it in the spiritual bucket as parts of our stories bring our foundation of faith into the mix. At the end of the day, it is a book about real people who had messy lives and crawled their way out of life’s pit to embrace wellness. Q: There’s no shortage of books on today’s market about journeys of self-discovery, introspection and empowerment. What do you feel makes your content unique in this regard? Jen: I think for one, we don’t play around. If you ever have a conversation with Courtney or me, you will quickly learn that we get to the heart of the matter fast. We don’t want to waste one more second of someone not knowing just how valuable and loved they are. We are very transparent and bring our very personal stories into the mix so people can engage and relate quickly. We have walked out all of the things we talk about. It is not text book or theory; it is a survival guide built around actual events. Q: Given that the material is faith-based, will the book resonate with women whose religious beliefs are different from your own? Jen: Absolutely as we share universal truths not religion. While Courtney and I have a few moments where we put it all out there from our perspective; we do take care to use words that remain open to universal truths. At the end of the day, truth is truth. And the light of love, forgiveness and acceptance will break through any darkness in life. The tools we provide others to walk through their journeys with are practical, proven exercises or affirmations. Q: What governed your decision to self-publish? Jen: The content was timely and needed to be out there to the masses not just our known group of people. It was so heavy on our hearts and we didn’t feel like we had time to spare. Q: What do you know about the publishing world now that you didn’t know when you started? Jen: Honestly, we still don’t know nearly as much as know we need to. Our goal remains to connect to women, not necessarily focus on the business aspect of selling mass books. I suppose the one thing we do, and it’s where our hearts are, is network and connect to others whose visions are in alignment with ours. Jen: I am a serious Doctor Who fan. Courtney: I am a sushi loving classic literature addict! Courtney: Our next book in the series is a 15 Day Relationship detox book. We have also had men ask us about a guy’s version of our series so we are exploring that option. And, we are very excited about our speaking and first retreat in 2014. Jen and Courtney: Thank you for the opportunity to discuss our business and our latest series; we truly appreciate your time and your passion!